Achieve denser, thicker eyebrows with the Ultra Slim Brow Definer from premium English brow specialists, BBB London. Infused with nourishing and conditioning ingredients, the retractable pencil features a precision tip that glides on effortlessly to mimic individual brow hairs and fill in even the tiniest of gaps for a professional-looking finish. Waterproof and smudge-proof, the matte formula delivers natural, hair-like colour to create enviable, well-shaped arches that last. 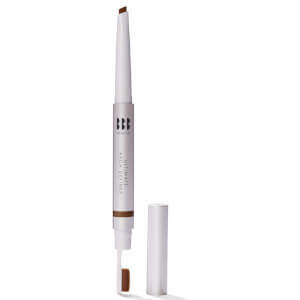 Apply in short, thin strokes to mimic brow hairs for a super-natural finish. Diisostearyl Malate, Triethylhexanoin, C20-40 Acid, C20-40 Alcohols, Polyethylene, Synthetic Wax, Glyceryl Behenate/Eicosadioate, Ethylene/Propylene Copolymer, Ethylcellulose, Boron Nitride, VP/Eicosene Copolymer, Tocopherol, Ascorbyl Palmitate. May Contain: +/- Ci 77891 (Titanum Dioxide), Ci 77492, Ci 77499, Ci 77491 (Iron Oxides), Ci 77019 (Mica). Ingredients may vary by shade. Please check individual packaging for most accurate ingredients.